BIRMINGHAM, England (AP) — Britain’s Brexit chief appealed for Conservative Party unity on Monday, as he warned the European Union that the U.K. will leave the bloc without a divorce deal rather than accept one that makes Britain follow too many EU rules. Brexit Secretary Dominic Raab’s call to “come together, because this is a moment for the optimists” fell largely on deaf ears at the Conservative conference in Birmingham. Instead, pro-Brexit politicians took pot-shots at the EU, pro-EU Conservatives battled to stop the U.K.’s exit from the bloc — and British Prime Minister Theresa May was caught in the middle, trying to cling to power. Pro-Brexit flag-waving got a warmer reception at the Conservative conference, where party members mixed with lobbyists, think-tank academics and a group of men dressed as soldiers from the Battle of Bosworth in 1485 — a time when Britain was engulfed in civil war and Europe seemed far away. May, meanwhile, faces a growing threat to her leadership amid deepening opposition to her Brexit plan, which would keep Britain in the EU single market for goods — in return for following EU regulations — while leaving it free to make its own rules on services. Pro-EU Conservatives, who have been sidelined since the country voted in 2016 to leave the EU, think opinion is turning in their favor now that the downsides of Brexit are becoming clearer. Several hundred people packed a meeting in Birmingham on Monday to hear from Conservatives calling for a “people’s vote” — a new referendum on any final Brexit deal, with the option to remain in the EU. 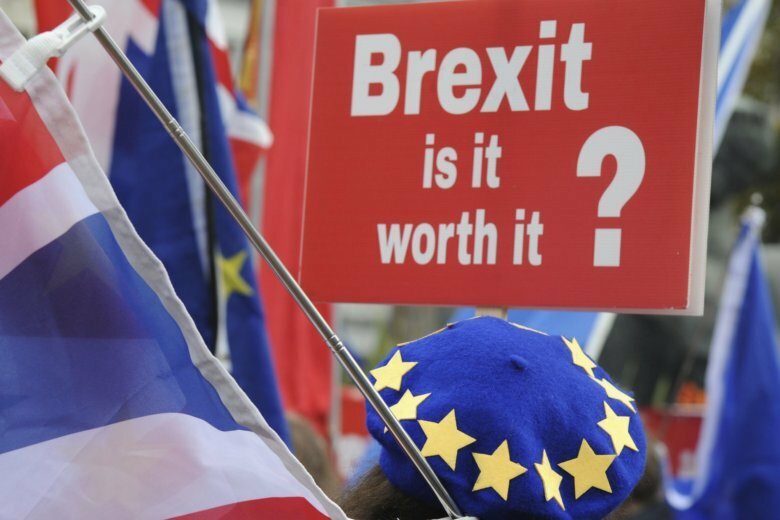 “Every single socio-economic ill that takes place between now and the next general election is going to be blamed on ‘Tory Brexit,'” said lawmaker Phillip Lee, who resigned as a junior minister over his opposition to Brexit.